People pick up knowledge in many ways. We can listen to a lecture, read a book, watch a demonstration, or try things out and learn by trial and error. Although we can learn in all of these ways, most of us have a preferred mode. Some people find it easiest to absorb information by listening. For instance, some students would prefer to sign up for a talk or hear an audio book rather than read on the same topic. Then there are those who find it difficult to focus when a teacher simply talks. They often need some kind of visual stimulation or hands-on activity to hold their attention. Such preferences are in-born, as well as shaped by one's environment and experiences. "Research points to both 'nature' and ‘nurture’ — although recent research shows that environmental factors can play an important role in influencing the development of young children," Says Dr. Karuppiah Nirmala, lecturer at the Department of Early Childhood and Special Education, National Institute of Education (NIE). Very young children absorb information about the world using many senses. Dr. Karuppiah gives the example of a baby seeing a rattle for the first time—he would look at it (sight), hold it (touch), put it in his mouth (taste), and shake it to make a sound (hearing). However, over time habits can set in. 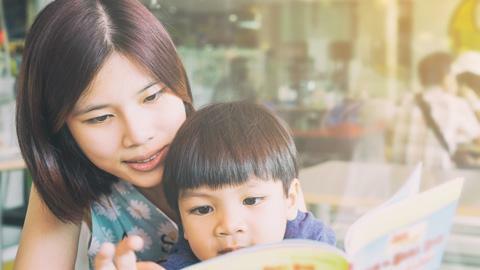 Assistant Professor Chia Kok Hwee of the Early Childhood and Special Needs Education Academic Group at NIE explains, "Learning style is behavioral and therefore can be considered to be habitual. As we all know, habits once set in are hard to change. Hence, once the child keeps using the same learning style for a long time, he or she develops a strong preference for it and that particular learning style sticks with him or her." Asked whether it is possible for a child to change his preference, Prof Chia says, "Yes. All children are adaptable to the changing environment and also to their developmental demands." Visual-spatial: Visual-spatial learners pick up information most effectively when it is presented in a non-verbal format such as pictures, diagrams, maps and charts. Auditory-linguistic: Auditory-linguistic learners prefer lectures and discussions. They learn best when information is verbalised.